Howard and Guy Lawrence hail from Reigate in Surrey and though still only in their mid-twenties the brothers have wasted no time in establishing their phenomenally successful brand, having won a deal with Island and also set up their own label Method Records with a roster including Friend Within, versatile star in waiting Karen Harding, Lxury and Tourist. National radio picked up on their early tunes – “Tenderly”/”Flow”, the June 2012 EP The Face (whose stand-out “Running” remix by Jessie Ware made a splash in the Flemish lowlands) and then the aforesaid “Latch”, a smart #11 in the UK. Ground set they were truly off with “White Noise” where a heady alliance with electronic duo AlunaGeorge set the digital download market buzzing. The bass, synths and beeps made commercial sense and follow-up “You & Me”, featuring Eliza Doolittle was a huge club hit across Europe. “F for You” is the first track from the Settle disc to not feature a guest and that’s Howard stepping up. The English art rock trio London Grammar come on side for “Help Me Lose My Mind” – their vocalist Hannah Reid co-wrote too. Once they revisit “F for You” with the famous Mary J. Blige as guest heads will wag across the ocean. Back to the garage for the deep sounding “The Mechanism” keeping them funky in 2014 and then to “Bang That” and “Holding On”, most people’s first taste in terms of discovering the imminent Caracal. Here they’ve gone into the writing room with Grammy Award winning English song man Jimmy Napes whose own “The Making of Me” is also recommended. The overview on Settle is so positive now that we heartily suggest you discover it via the Deluxe edition and the total remix special Digital edition that remains bang on trend. In America there has been a huge buzz surrounding “Holding On”, the combo of the youthful Disclosure and the US jazz singer Porter striking all the right notes. Disclosure are all about the team and the right sound and they haven’t put a foot wrong yet. Watch them soar this year. Cunning if not particularly novel synthesists, Surrey's Guy and Howard Lawrence draw from several styles and sub-styles of dance music -- house, garage, dubstep, bass -- and add pop appeal on Settle, their first album. The Lawrences began humbly with MySpace uploads of scruffy, sampling-enhanced dubstep tracks, but they quickly accelerated to making lustrous, impeccably assembled tracks with varied vocalists. Between October 2012 and April 2013, the duo released a trio of singles that fared no worse than number 11 on the U.K. pop chart: the soaring shuffle-tech of "Latch" (with a bursting, almost overdone lead from Sam Smith), the undeniable crossover house track "White Noise" (a perfectly timed partnership with upcoming duo AlunaGeorge), and the rush-inducing so-called future garage of "You & Me" (featuring Eliza Doolittle, something of a sequel to their fine remix of Jessie Ware's "Running"). Those hits appear here. Without them, the album would still be generous. Few tracks, however, will appease those who bemoaned the duo's departure from relying on sampled and treated vocals. The sluggish "Second Chance," where a downcast Kelis line dissolves into mush, and the rattling "Grab Her!" -- its refrain pinched from Slum Village -- are no match for past sample-heavy delights like "Carnival," "Flow," or "What's in Your Head." The new vocal cuts are either near the level of the hits or are merely pleasant. Howard Lawrence's lead turn on "F for You" approaches the sweetness of Scritti Politti's Green Gartside. Teenaged Sasha Keable sounds wise beyond her years on "Voices," one of the album's deeper house tracks ("I tried to dismiss what you taught me"). London Grammar's Hannah Reid has the unenviable task of following Doolittle, Jamie Woon, and Jessie Ware but delivers one of the most heartrending leads on "Help Me Lose My Mind." Like the closing songs on the first three Basement Jaxx albums, the song initially comes across as an insignificant finale but gradually bubbles to the top as a discreet highlight. 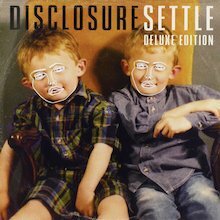 Considering all the shrewd alliances and its polished attack, Settle seems like it was designed to be 2013's acceptable dance album. That said, any purist who denies its pleasures is a crank.